The Next Steps project has materials in different formats to help you engage families in the transition planning process. 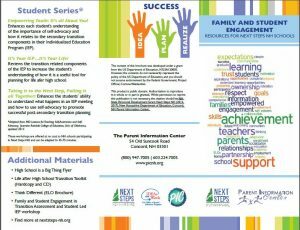 An overview of seven professional development workshops and three student workshops from the Parent Information Center. 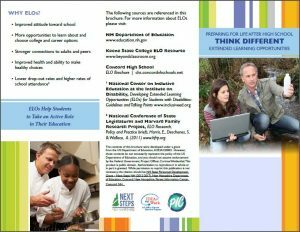 These workshops are available at no cost to Next Steps NH cohort schools, and to other schools for a fee. (PDF, 2 pages, 2016) Materials from some of these workshops are available in the For Parents tab in Training Courses and Materials Section. 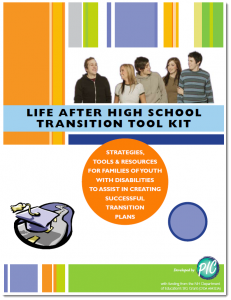 The Life After High School Transition Tool Kit (PDF, 72 pages, 2016) helps families and youth who have an Individualized Education Program (IEP) learn about the transition planning process. It provides an overview of the laws relating to transition as well as best practices. The sections are: Thinking about the Future, Making a Plan, Writing the Transition Plan in the IEP, What Else do I Need to Know, Review and Revise, and Give Youth an Opportunity to get Involved. 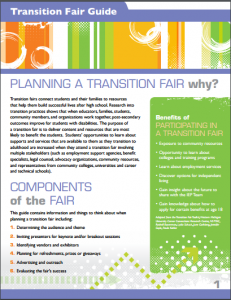 The Transition Fair Guide (PDF, 12 pages, 2017) has information and things to think about when planning a transition fair. 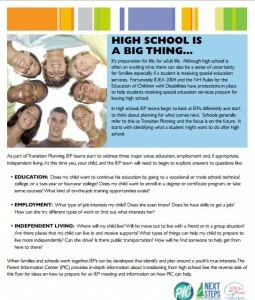 Transition fairs connect students and their families to resources that help build successful lives after high school. Research shows that when educators, families, students, community members, and organizations work together, postsecondary outcomes improve for the students. 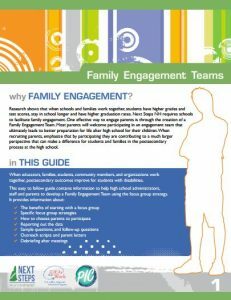 Family Engagement Teams (PDF, 12 pages, 2017) applies a focus group strategy to include parents in a review of how effectively a school works with families. A group might be a follow-up to a survey, or a sole means of gathering parent comments. Groups usually include six to twelve participants. This guide leads you from initial concept to inviting parents to conducting the meetings. 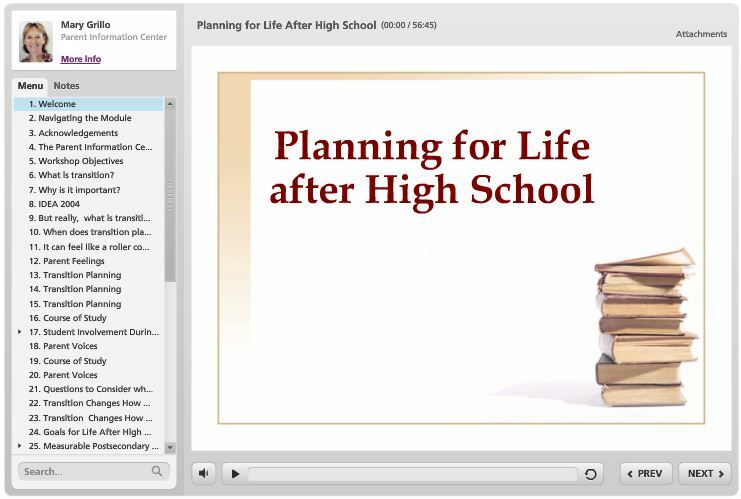 The Parent Information Center (PIC) created an online version of their popular Life After High School training for families (and educators). It takes about an hour to complete and is a narrated PowerPoint presentation with parent video commentary and interactive self-quizzes. The format lets you skip around the course at will. 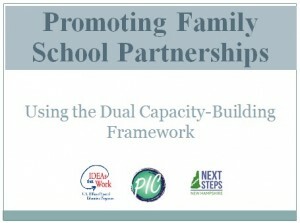 You’ll get a good overview of laws and best practices that help families and schools work together to create purposeful and meaningful transition plans and IEPs. 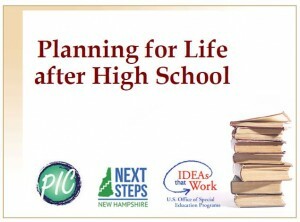 Below are slides from parent workshops developed by New Hampshire’s Parent Information Center (PIC). You may find the slides helpful by themselves, or contact PIC to arrange something in-person. Full materials are available for each workshop. 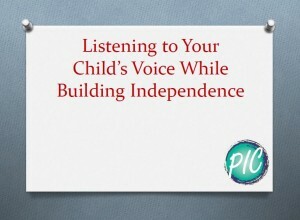 Slides from “Listening to Your Child’s Voice While Building Independence.” Provides information about the importance of listening to your child’s voice when discussing the future, what to consider before your child becomes a legal adult, and how to start building independence during the high school years. 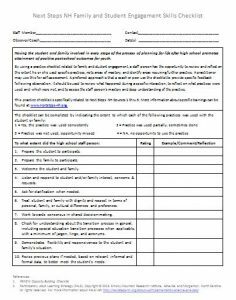 The Family and Student Engagement Skills Checklist (PDF, 1 page) gives you the opportunity to review and reflect how you used specific practices, to note areas of mastery, and to identify areas requiring further practice. Although you can use this checklist for self-assessment, the more effective approach is to ask a coach or peer to use the checklist to provide specific feedback to you following observation. Use it to review what happened during a specific interaction, to reflect on what practices you used and did not use, and to assess the your mastery and deep understanding of the practice.